This was really uncalled for, I wasn't really ready for this fish when I went fishing today, but damn I am lucky!! 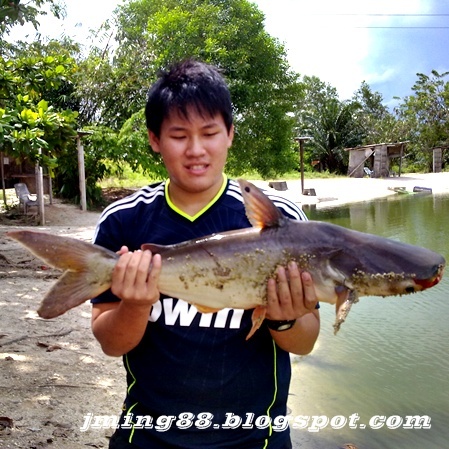 I caught my first Mekong Fish. Muaahahahaha it puts a freaking smile on my face. 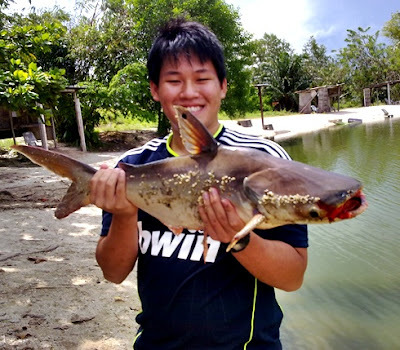 After that was a Rohu and a few other small fishes like Telapia which makes me freaking piss off as they kept eating my bait. Owh I am a happy man... my mata damn sepet and I can't stop smiling Muaahahahaha. It took me 20 minutes to pull this one up, this fish is a real fighter. Everytime when it is near to the surface, it runs back into the deep again, pulling out strings from your reel, I was partly praying that my strings didn't break in the middle of the fight. 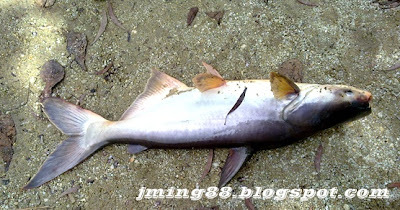 However, it gave up at the end and surface up to th shore, I reel it in and drag it on to the higher ground by its tail. I was jumping with joy that time and release the fish from the suffering of hook. Snap a few pictures with it and then let it run back into the pond while I kept my happy memories and threw my second cast.